STOCK ISLAND, KEY WEST’S geographical next-door neighbor, is somehow simultaneously a bridge and an entire world away. But over the last few years, due in no small part to a fanatical cadre of Stock Island celebrants and to the opening of two new high-end hotels, The Perry Hotel and Ocean’s Edge, Stock Island seems to have come into its own as a destination in its own right — a long time coming when you consider its long seafaring tradition, vibrant creative community and boundless culinary riches. Stock Island is where locals go to show out-of-towners what Key West used to be like, back in the days before the blaring voice of a trolley tour guide became as ubiquitous as the early morning call of a rooster in Old Town. For many who live here — and who have lived here for years, generations, even — Stock Island is less an exhibition of what was than a reminder of what can endure, even when your town becomes a tourist destination and its streets teem with visitors hurrying to and from cruise ships, umbrella drinks in hand. Stock Rock, as it is (sometimes) affectionately called, is proof that family businesses can survive, that a con leche doesn’t need to cost $5 and that working fishermen can still make a living on the same island that recently broke new records for the most expensive entry-level rental apartments in Florida (take that, Miami). Proof that the Key West of Hemingway, of Tennessee Williams, even of Buffett and Chesney, a live-and-let-live place of cheap rum and prolific fishing, is alive and well. But to use Stock Island as a foil to Key West’s increasing Disneyfication greatly underestimates the neighborhood’s hidden charm and worth. But for all its affordable housing options for residents priced out of the neighborhoods in which they work, its funky roadhouse eateries, its utilitarian aesthetic and its street cred for being the only place a working artist can afford to, well, work these days, Stock Island has also been steadily gearing up for a renaissance of sorts. The neighborhood’s Bernstein Park just completed a $7.9 million renovation, which provides residents with new fields, a playground, basketball court, exercise trail and 5,500-square-foot community center. Brick oven pizzerias, luxury hotels and French bakeries that wouldn’t look out of place in a tony Connecticut suburb are becoming more commonplace, and a pervasive sense of overall sprucing up make Key West’s industrial sidekick much more than just a sepia-toned memory of the days before Duval Street could be reached via direct flight from Dallas. It’s a neighborhood overflowing with the buzzy, frenetic energy that begets a slew of Travel & Leisure articles calling it the New Authentic Place for Your Next Hip Vacation. Unlike the try-hardiness of Key West’s souvenir shops, chain restaurants and two-for-one happy hour specials, Stock Island doesn’t seem to care if you give it a rave review on TripAdvisor. It’s grittier — less interested in courting the attention of tourists, less desperate for jet-ski bookings. It’s not trying to be cool, and thus it’s deeply cool. To hear those who remember the town before there was a CVS on every corner tell the story, it’s how Old Key West used to feel. The Stock Island lobster trap tree. 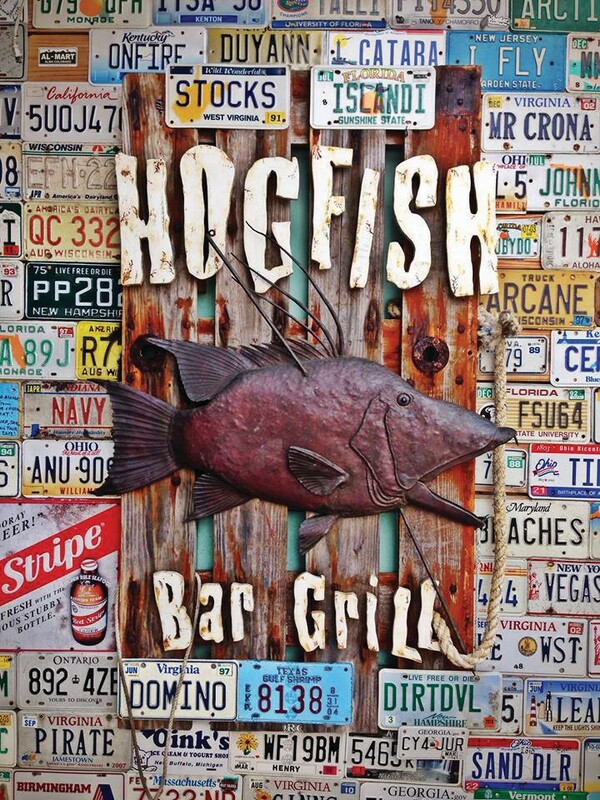 Hogfish Bar & Grill is a Stock Island favorite. But according to some of Stock Island’s longtime champions, it’s time we celebrate this lively neighborhood for everything it is — not everything that Key West was. Time to carve out a couple days for a festival centered exclusively on Stock Rock (and really, if Key West has room to cram another festival into its already swollen calendar of Key-Lime celebrating power-boat-racing-Parrot- Head-carousing festivals, you know it must be for something really important). 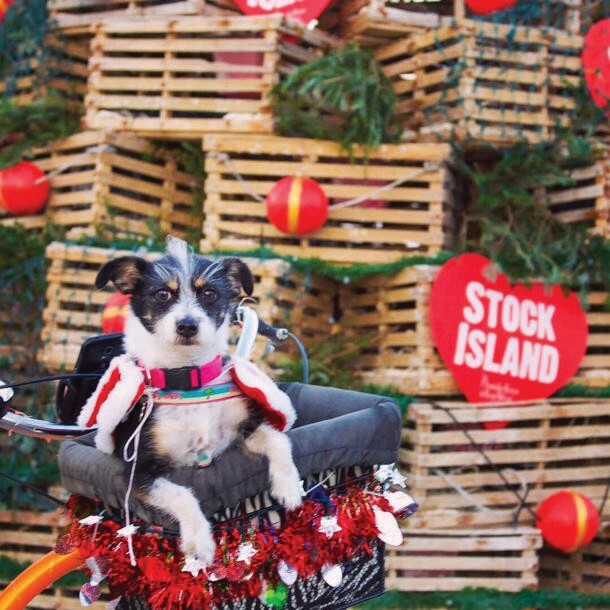 Beginning on Dec. 7, the I Love Stock Island Festival aims to offer everything that is great about Stock Island packaged into three family-friendly days of nonstop food, live music, rum and seafood so fresh you should watch out for lingering hooks. The idea is to mix a series of ticketed and free events across the neighborhood, with some obvious participants (like Hogfish Bar & Grill, the first to snag a New York Times rave) and some notso obvious ones (Stock Island Chevron, we had no idea you cared). To kick off the weekend, Friday night’s Taste of Stock Island (technically the festival’s original focus, before so many local businesses expressed interest that the founders decided to expand the event to a three-day affair) will offer a ticketed, multi-stop (at last count, there were ten participating establishments) small plate experience for those looking to experience Stock Island’s burgeoning foodie scene. $75 nets you a trolley tour of Stock Island’s best eateries for specially selected small plates and beverage pairings. Since the trolley is limited to 35 people, Taste of Stock Island presents a unique opportunity to interact with the chefs and owners of Stock Island’s finest culinary establishments. Tickets can be purchased online at www.showclix.com/event/taste-of-stock-islandEVsh- F2i and, although the rest of the weekend is exceedingly family friendly, for obvious booze-related reasons the Taste of Stock Island tour is limited to guests 21 and over. Want to taste Stock Island on your own schedule? Friday’s all-day Food Truck Finds will allow you to food truck hop all over the neighborhood, with each mobile culinary wonder offering $5 samples of what they do best. Participating food trucks include Taco Grilla (US 1 North next to We Cycle), Taco Express (Cross Street next to the bus stop behind Sandal Factory), Yahman’s Authentic Jamaican Jerk Shack (Front Street at COAST), DeLuna’s Bar and Grill (Stock Island Marina), Island Boyz Seafood Key West (Maloney Avenue just past El Mocho), Until It’s Gone (Key West Harbor Yacht Club) and Chef Clive in a Nutshell (US 1 North next to Stock Island Chevron). To really get a feel for the island, feel free to rent a bike from We Cycle and pedal your way from truck to truck. Bonus: all that cycling will ensure you still have an appetite after you’ve stopped at four or five trucks. Two birds, one stone. Once the sun sets (a gorgeous site from any of the marinas on Stock Island), the boats participating in the second annual Stock Island Lighted Boat Parade presented by Sunset Watersports will fire up their twinkliest lights and set sail. Beginning with a pre-parade dock walk and happy hour at 5 p.m. at the Stock Island Marina Village, guests will get to ooh and aah over every manner of vessel, from tri-masted schooners to dinghies to the shrimp boats that call Stock Island home. The parade’s convenient location inside the Stock Island Marina Village (with additional viewing potential at Safe Harbor Marina) means that parade goers will have the option of noshing at Matt’s Stock Island Kitchen & Bar at The Perry Hotel, the Perry’s Salty Oyster bar and DeLuna’s, as well as other concessions and bars throughout the extensive marina property. The parade officially begins at 7 p.m. and Hogfish Bar & Grill will host the official Beach Bum after-party at 8 p.m., so plan on donning your brightest Hawaiian shirt and dancing the night away, the stars (and boats) twinkling in your eyes. Saturday is all about discovering Stock Island and, more importantly, showcasing the all-new Bernstein Park. The day kicks off nice and early at 9:30 a.m. (OK, maybe not that early) with the Rooster Run 5K Walk/Run, the first ever Stock Island 5K, presented by Theme Runs and Fyt Key West. The course will take you on a scenic tour of the waterfronts, neighborhoods and businesses as you explore Stock Island in a whole new way. If the prospect of a race T-shirt, a shiny medal and free beer doesn’t get you going, the rest of the festival starts at 10 a.m. at Bernstein Park, where you can feast on food truck fare and listen to live music until 4 p.m. If you’ve got a rugrat or two, you can enter them in the first annual Little Mr. & Miss Stock Island Contest at 11 a.m. Open to girls and boys ages 4 to 6, children will be awarded points based on their Historic Florida Keys-themed costumes, stage presence and personality. In addition, adults may enter the Cuban Pig Roast: Chinabox Challenge, your chance to prove you make the best Cuban pork in the Keys. Open to amateur and professional chefs, winners will receive trophies and, arguably more importantly, bragging rights. Also, on Saturday, a free, day-long Discover Stock Island scavenger hunt will allow those in possession of a special pirate map the chance to tour the island’s 50-plus participating businesses, restaurants, galleries and attractions via trolley for a chance to find “treasure” in the form of prizes, freebies and discounts. Businesses, restaurants, galleries and attractions will host open houses with specials all day long. Participants will get to choose the track they identify with most — art lovers, foodies, history buffs and families. In addition, Up the Keys Tours will offer $10 history tours and Sunset Watersports will offer $10 banana boat rides. 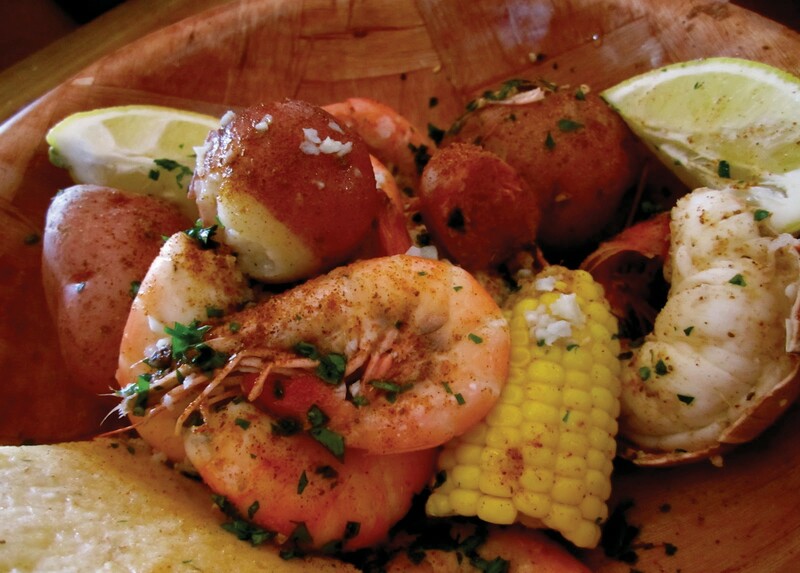 On Sunday, from 11 a.m. to 5 p.m., Hogfish Bar & Grill will have a traditional low-country shrimp boil, featuring Key West pink shrimp fresh off the boats, smoked sausage, new potatoes and sweet corn on the cob. Tickets for the shrimp boil run a mere $19.99 and can be purchased at www.showclix.com/event/hogfishshrimpboil. And if you get a little shrimp drunk and want to do some Christmas shopping, you can check out the Island Greater Goods Market at the Lost Kitchen Supper Club at Safe Harbor Marina, featuring some of the finest artisans in the Lower Keys. If you’d rather pet something fluffy or whisper sweet nothings into a llama’s ear (we feel you), the annual Christmas at the Sheriff’s Animal Farm will take place from 1 to 3 p.m. on Sunday afternoon. If Stock Island is experiencing something of a Renaissance, it is due in large part to Bobby and Michelle Mongelli, the powerhouse duo behind many of the island’s much-lauded eateries like Hogfish Bar & Grill, Geiger Key Marina & Smokehouse and Roostica. As Stock Island’s reigning King and Queen, the Mongellis know a thing or two about celebrating the Key West of then and now. Michelle is a born and raised Conch, while Bobby can trace his Key West linage back to the late 70s, when he arrived to work at the Casa Marina Hotel in his late teens. 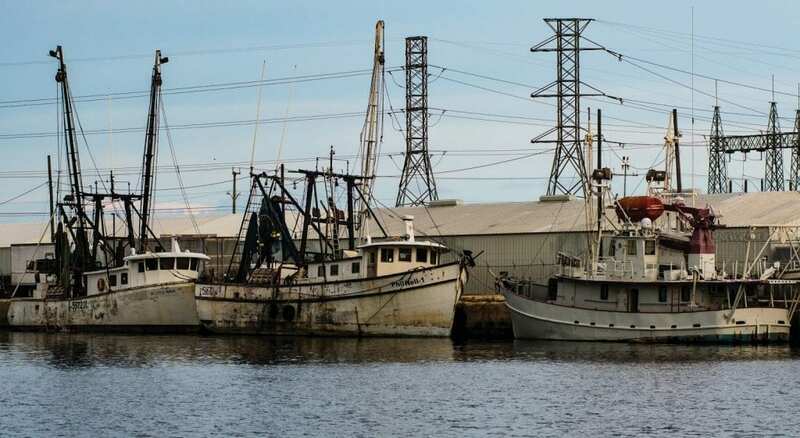 The two developed the “I Love Stock Island” tagline, had bumper stickers made and ramped up interest in forming a nonprofit aimed at preserving the culture and history of Stock Island for generations to come. Then, they tapped Sean Krikorian and Jill Snodgrass to help market the event and bring a cohesive voice to the organization’s dreams.